Jeff is ready to ride. On Wednesday, October 19th, we took a day ride. Our destination was the Devil’s Triangle, a winding curvy road that travels through Anderson and Morgan County and runs right past the famous Brushy Mountain Prison. We left our home in North Knoxville at 10:15am then stopped briefly at the Triumph shop to check on some parts. After visiting with the guys for a few minutes we headed north on Clinton Highway. We stopped at Weigel’s to fuel up and get a morning snack. We then continued on Clinton Highway and on into Rocky Top. On the road in Rocky Top heading to 116. We took 116 to start the Devil’s Triangle ride. We continued on 116 riding up the mountain with its many curves and switch backs- a road that is quite challenging with not only tight curves but also extreme drop offs. View of one of the switch backs along 116. Experts advise that you ride the Devil’s Triangle in a clockwise direction- but today we rode the Triangle backward- which is indeed more challenging. Of course, it’s beautiful either direction. The leaves are in full autumn glory. Nice views on the Triangle. We stopped along a bridge to see the view. The skies are beautiful too. We’re headed in the direction of the arrow. Pamo is ready to ride. It’s easy to see why the Devil’s Triangle is so well loved. It’s a ride you should do in every season. The ride eventually took us to the now closed Brushy Mountain State Prison. Entrance to the Brushy Mountain State Prison. Jeff at the prison gate. Test car from Detroit doing the Devil’s Triangle. In the parking lot of the Brushy Mountian Prison. Brushy Mountain Market where everyone is very friendly. Brushy Mountain Market part 2. Their famous fried bologna sandwich. It was a great sandwich that neither one of us could finish because it was so big! Brushy Mountain Market is great place to stop for lunch. You can see it has lots of ambiance! After lunch we rode to 62 which took us into Oliver Springs and then back to Clinton. We stopped off to check out the new Yamaha SCR 950. Then we headed home. We got home at 3:45pm and our total ride was 105 miles. Jeff gets the best greeting of all. 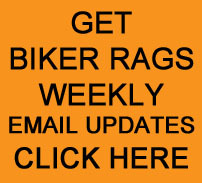 This entry was posted in Day Ride and tagged Biker Rags, Day Ride, Devil's Triangle. Bookmark the permalink.